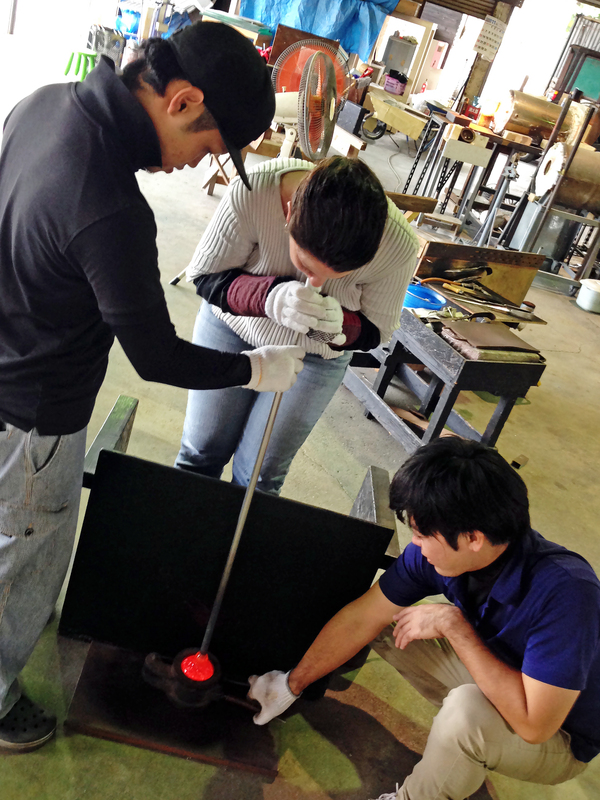 The accounting of the development of Ryukyu Glass is one crafted out of war, hardship and Okinawan rebirth. 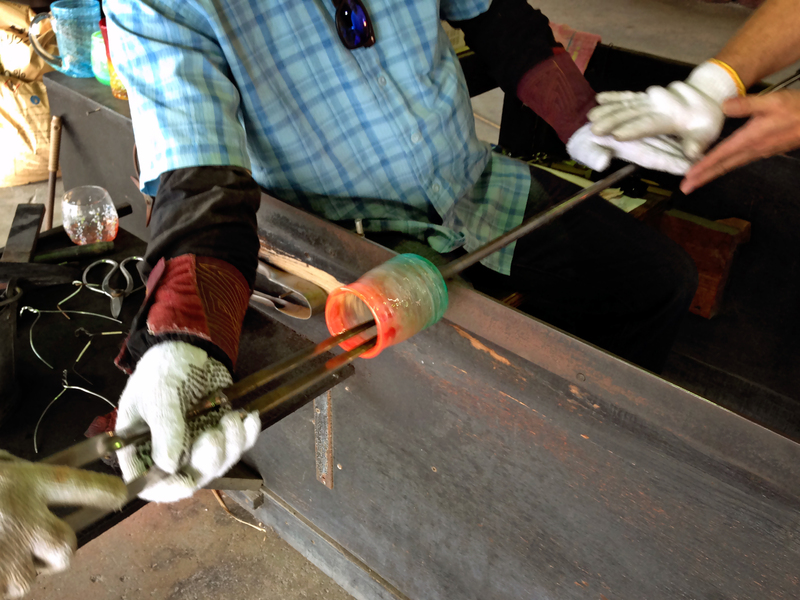 The craft of glass blowing was still in its infancy when war finally arrived on Okinawa’s shores in the spring of 1945. Prior to that time there was relatively low demand for glass, with pottery being the mainstay trade supporting needs for crockery. Homes and businesses of the time still lacked windows as we know them in our modern, western sense. Pragmatic items, such as gas lamps, medicine bottles and sake or awamori jars were the extent of glassware items which were locally manufactured. 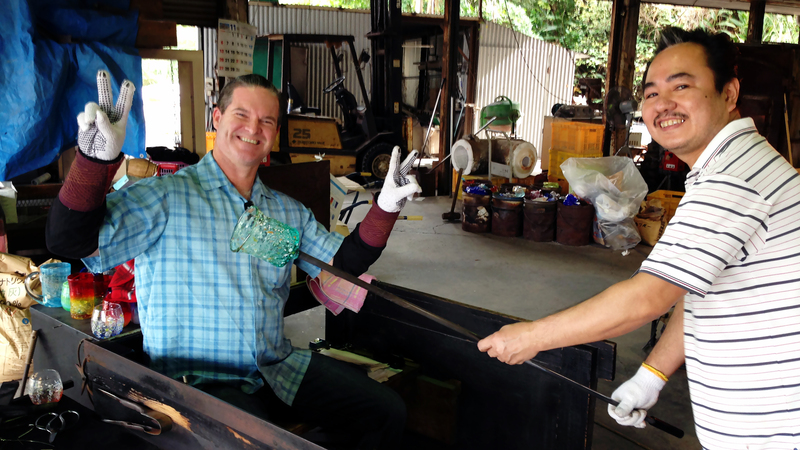 Thus, the very few highly skilled glass makers who made up the trade on Okinawa were likewise devastated during the fierce Typhoon of Steel suffered by the island and its people. 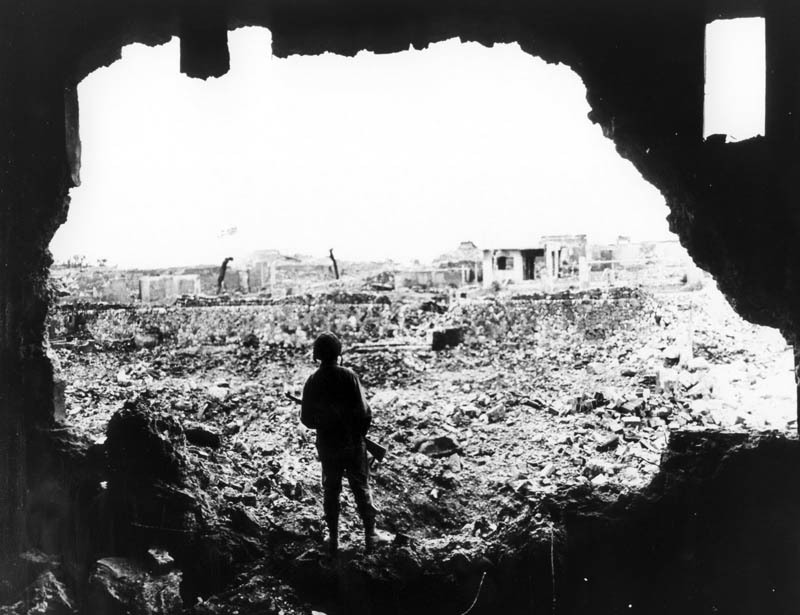 Upwards of fully 1/3rd of Okinawa’s civilian population was outright killed, with probably upwards of another third injured or disabled; almost every single survivor was internally displaced, having lost their homes and most of their belongings. 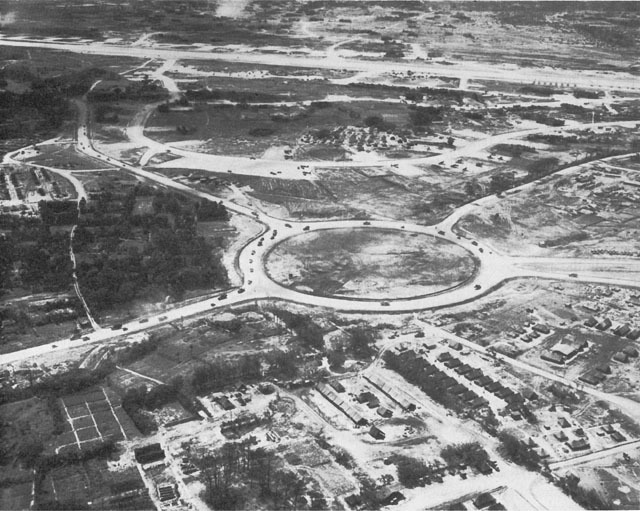 The demand for glass, however, suddenly spiked during Okinawa’s recovery and occupation by allied (American) forces immediately following Japan’s surrender. Those tradespeople left returned to their shops in the hopes of rebuilding, but often found little more than piles of burnt rubble so iconic of the complete devastation visited upon the Ryukyu Islands. 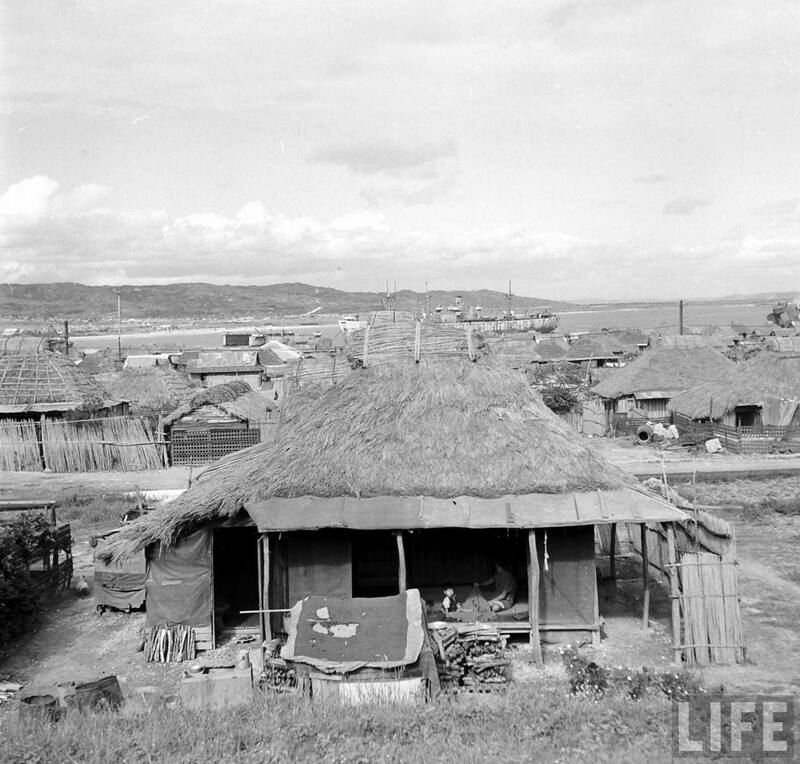 Desperate times almost always call for desperate measures, and Okinawans were forced to make use of whatever structures, fuels and raw materials which were available. The Soda-Lime Composition of War-Era Coke Bottles Still Provides Beautiful Sea Glass on Okinawan Beaches Today! The Okinawan people began collecting bottles discarded by occupying forces. Legend has it that Coca-Cola bottles tossed from ships and found in the many military’s camps’ trash heaps fueled the initial glass boom on Okinawa immediately after the war. 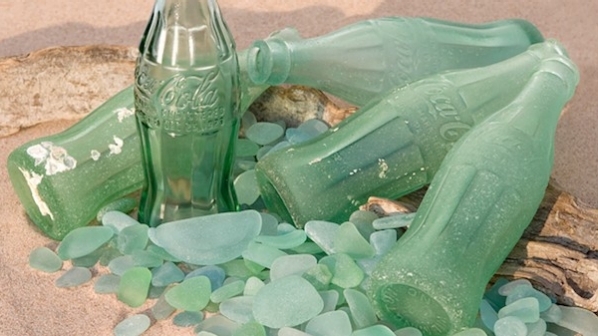 I can tell you this: scuba divers routinely still find Coke bottles dated “1945,” and sea glass is a full-time hobby for many since there seems to be a never-ending supply of smoothed and rounded glass washing up on the Okinawa’s shores. Lucky for the island, there was a steady and sustained stream of cast-off glass courtesy of the Americans. One man’s trash is another’s treasure. 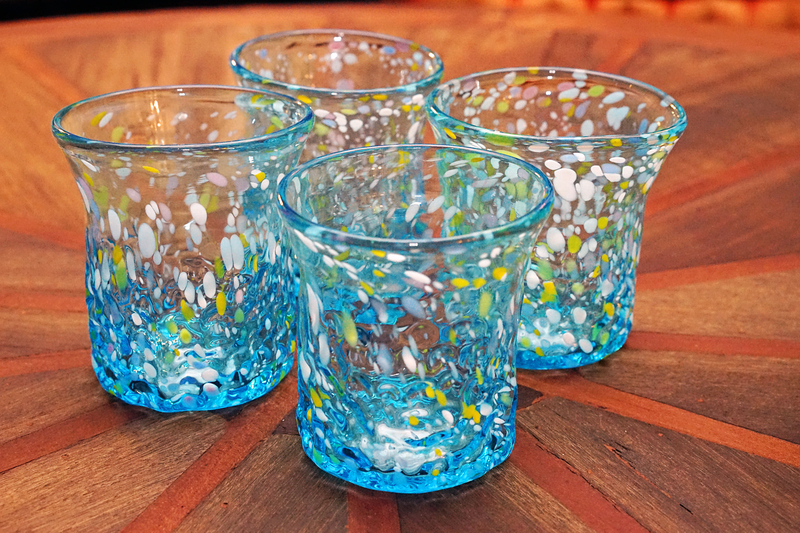 These discarded soda-lime glass bottles were melted down and re-blown on Okinawa into what slowly morphed into a unique type of recycled glassware: Ryukyu Glass. 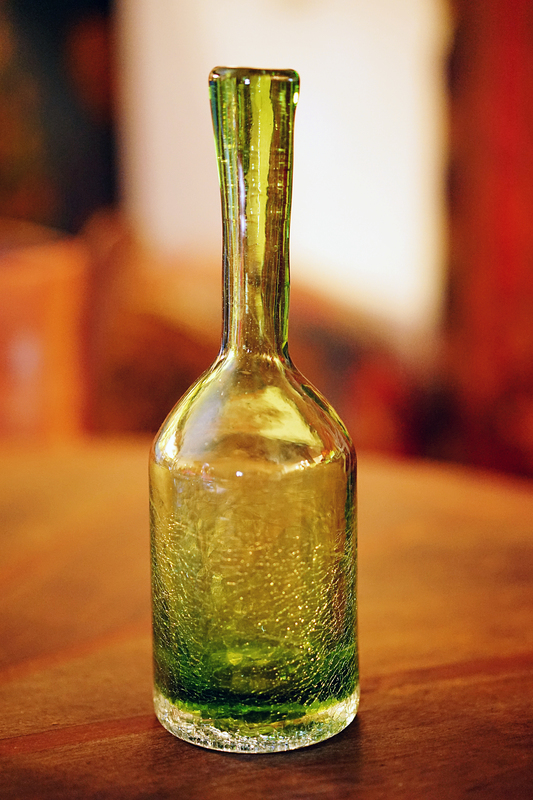 This locally made glass quickly became popular with American GIs who bought them in some cases as vestiges of far-away civility left behind, or as souvenirs for girlfriends or family. So, not only did the occupation of Okinawa supply raw materials for this new industry, it also became its largest economic base. 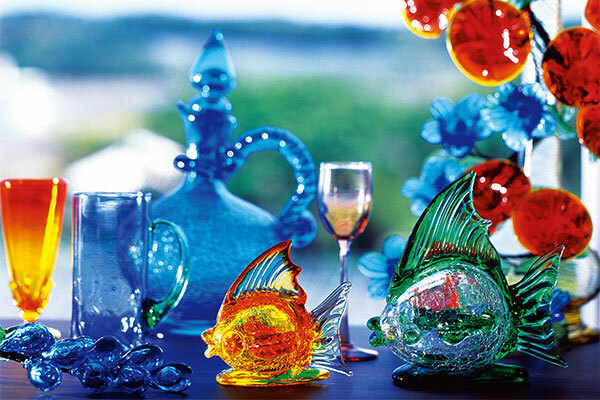 Prior to Okinawa’s reversion and return to Japanese sovereignty in 1972, 60% of the glass fashioned was exported to the United States via troops stationed in Okinawa, 20% went to mainland Japan, and the remaining 20% was sold locally within the Okinawan prefecture, which includes the majority of the islands in the southern half of the Ryukyu Island chain. 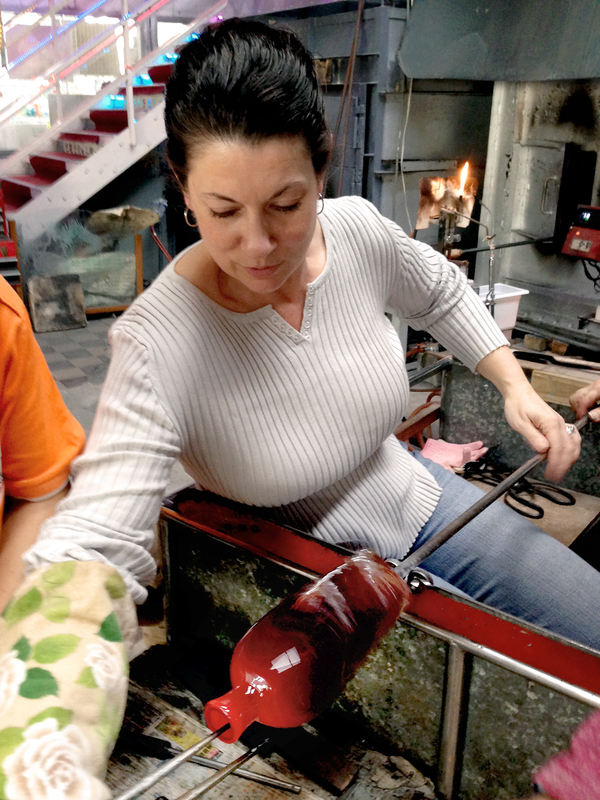 Since those hard, early times of the late 1940s and 1950s when this vocation was struggling for a stable foothold, the Okinawan art of glass-making has blossomed into one of the island’s proudest, yet youngest traditional craftworks. Now known throughout Asia, visitors come from far and wide to buy exceptionally ornate pieces selling for thousands and thousands of dollars. 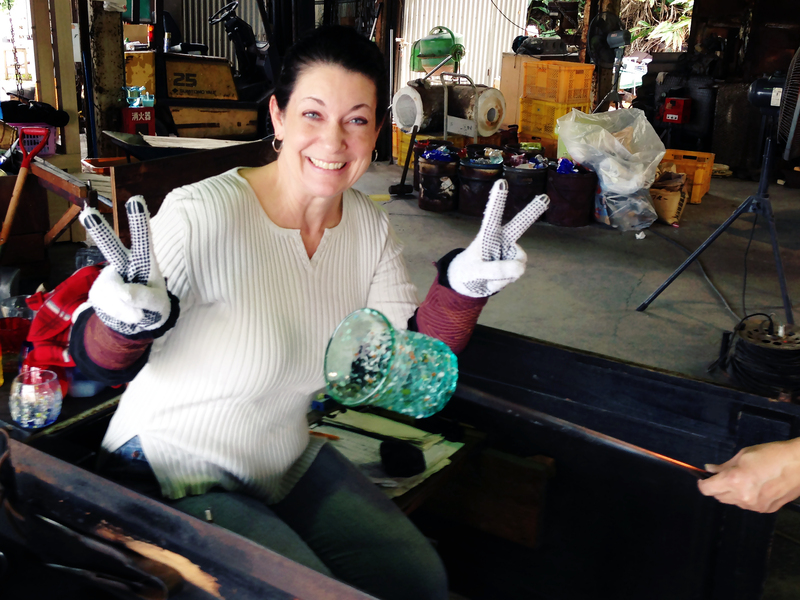 For her birthday this year, I treated Jody to a weekend get-away centered on a hands-on glass-blowing experience, something we’ve been meaning to do for over three years now. Staying at the Okinawa Renaissance Hotel for two nights, the local glass factories in Okinawa’s Onna area were within easy driving distance. 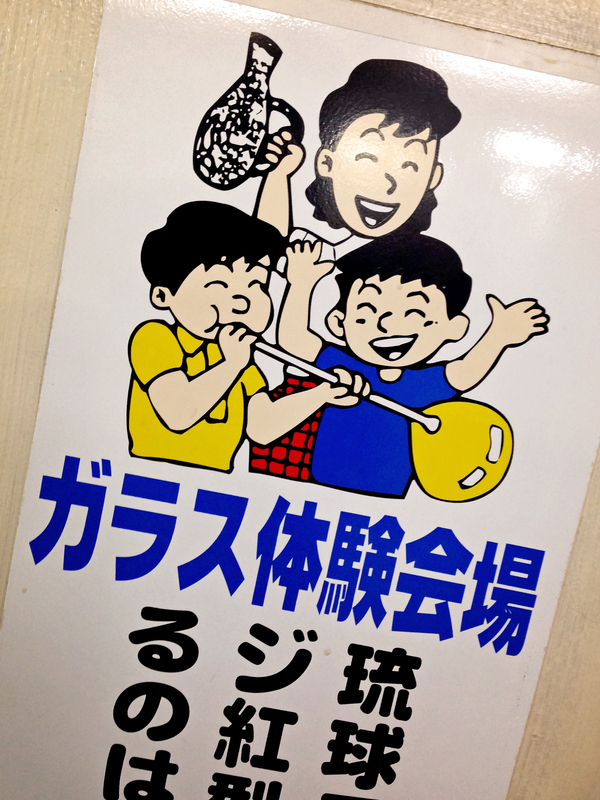 The first location we tried is called Okinawa Kougei Mura. 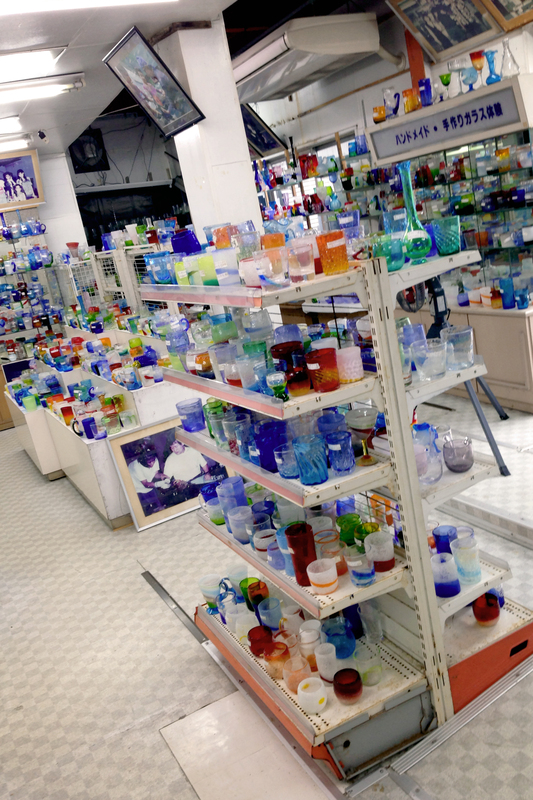 A large glassware showroom is found here, along with an adjoining and rather disorganized glass-blowing studio largely open to the elements. 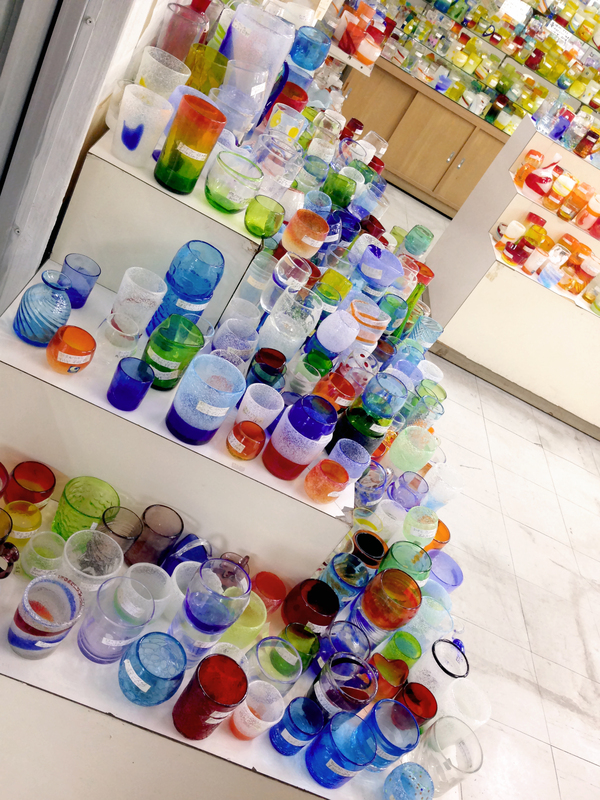 The sales area displays a huge array of glass pieces of every design, but be warned that there is only a small selection of items (mostly cups and a few vases), that you can try your own hand (and mouth) at producing, which are found outside next to the factory floor. 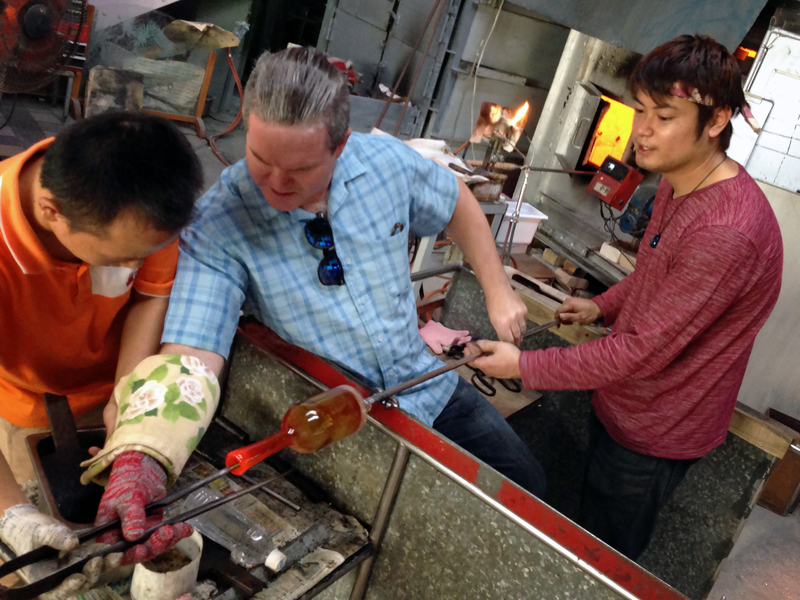 Further, the experience here includes only a minimal 2 steps of hands-on during the glass forming process. On the flip-side, this is an inexpensive and relatively quick encounter. 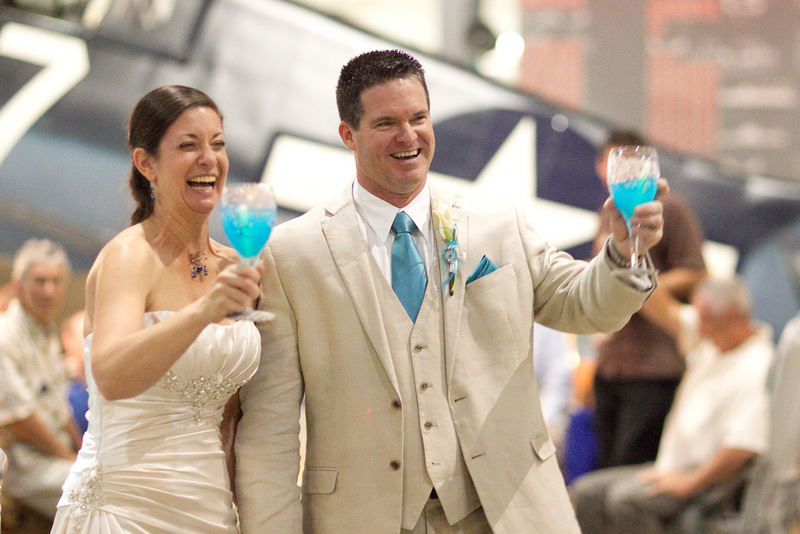 Our Wedding – Hard to Miss THAT Color! 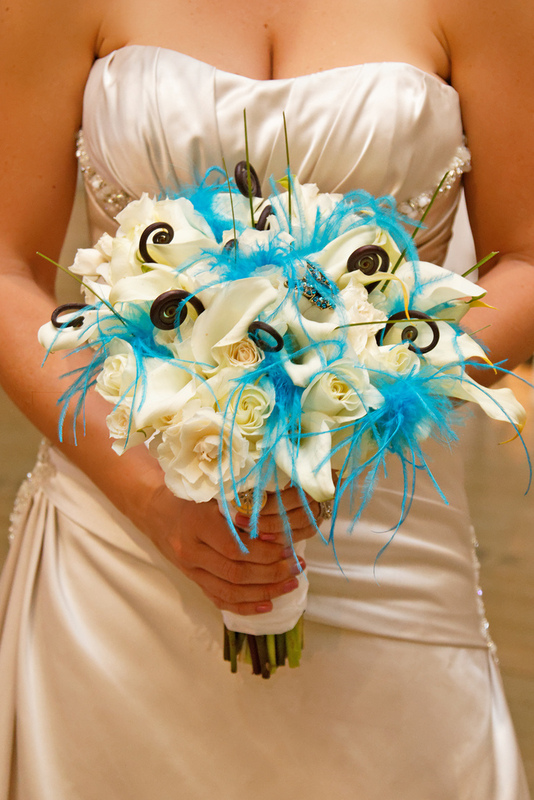 Here we decided to make a set of Ryūkyūan glasses in roughly the colors featured throughout our wedding – blue and turquoise. We selected a rather unique design, a wide-mouthed tumbler with a bumpy-textured base and flared top. 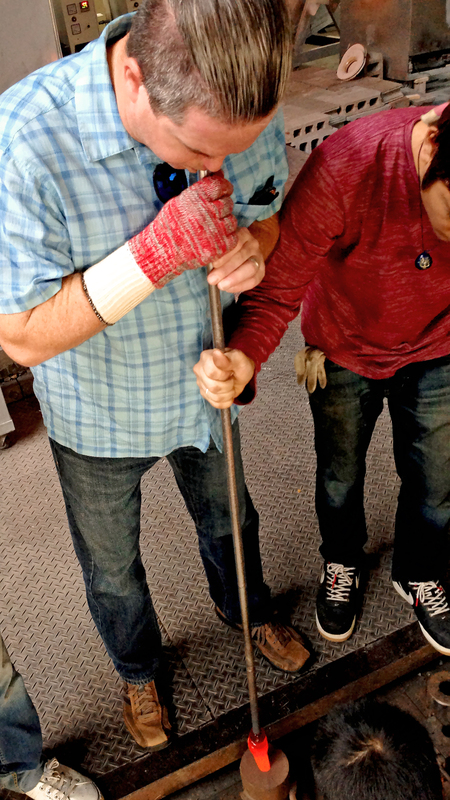 The craftsmen on the studio floor apparently speak very little English, so Jody and I made it very clear exactly what we wanted to the always polite and over-dressed sales woman, who then reminded the glass-blowers at least 4 or 5 times about the flared rim we so eagerly wanted! Jody was to make two glasses, and I would make the remaining two. Instead of each making two and then switching roles between artisan and photographer, for some reason the shop had us alternate one at a time. Not a big deal, except for having to don – and then slip off all the protective gear an extra time! The glasses turned out beautifully, except for the one birth defect I forced during one of my attempts. Forming the flared top was perhaps the most delicate part of the entire process, and of course this was one of the hands-on elements! For one of my prenatal glasses I was, let’s say, a little too eager. I’ll leave it up to the reader to see if you can spot my “special” glass, which already provides an amusing story and priceless memory of our weekend. Be advised that you are the master of your glass’ destiny, and being hand-formed each and every time, no two pieces are alike. Which is exactly what makes this all so uniquely charming! 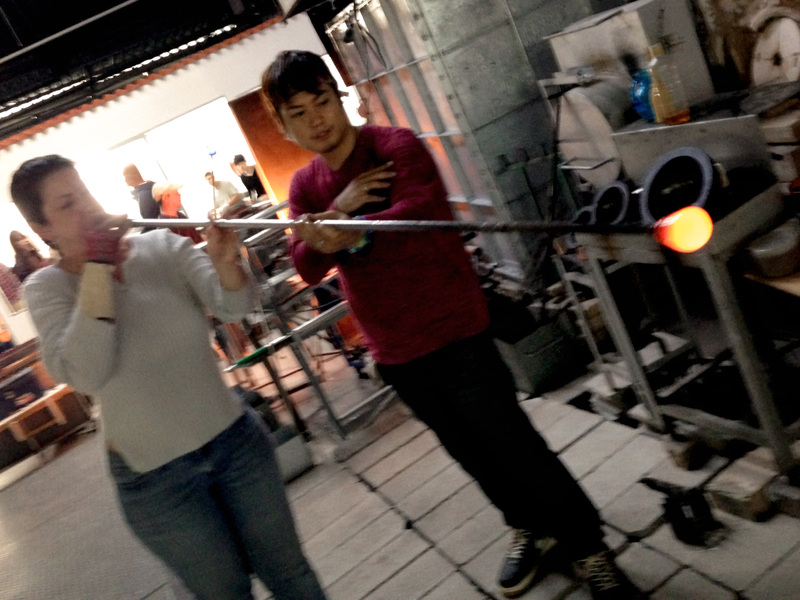 Since we wanted to make something more, well, special, we decided to go to another location, a factory with a much more extensive showcase and workshop called “Onna Glass Studio.” Here we were not disappointed. But we were overwhelmed! 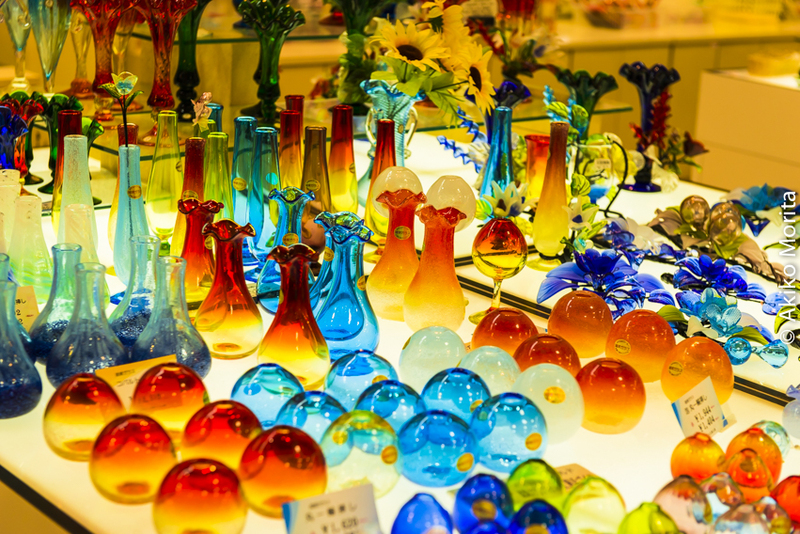 There is a substantial room, separated from the store’s high-end showcase, literally crammed full of glass pieces, consisting of what seems like every type and color of glass vase, cup, bowl, and drinking glass you could imagine. And any one of them was fair game for production on the factory floor. It was actually really difficult to select something that we desired to make; the options appeared almost endless. Models of What We Were to Create! I think I might have spotted my glass desideratum first. 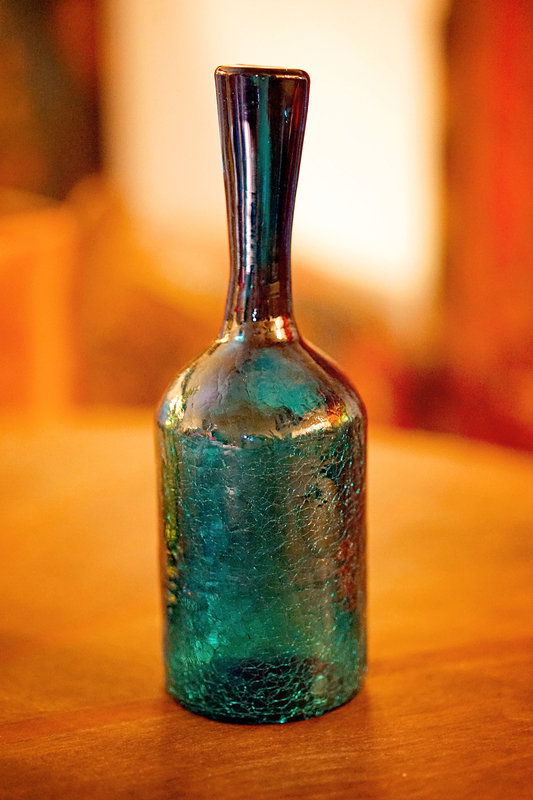 After probably a full thirty minutes scouring through the showroom, I saw it: an oddly proportioned long-neck, crackled vase/bottle with a flared top in the most interesting color of blue, historically the rarest color in glass as I understand it. It’s a bottle that one would imagine from which a genie would appear. Proudly bringing it up to the counter with a huge smile on my face, the saleswoman immediately shuts me down with a dismissive “no have, no color, cannot make….” Did she have any idea how hard that was to find!? 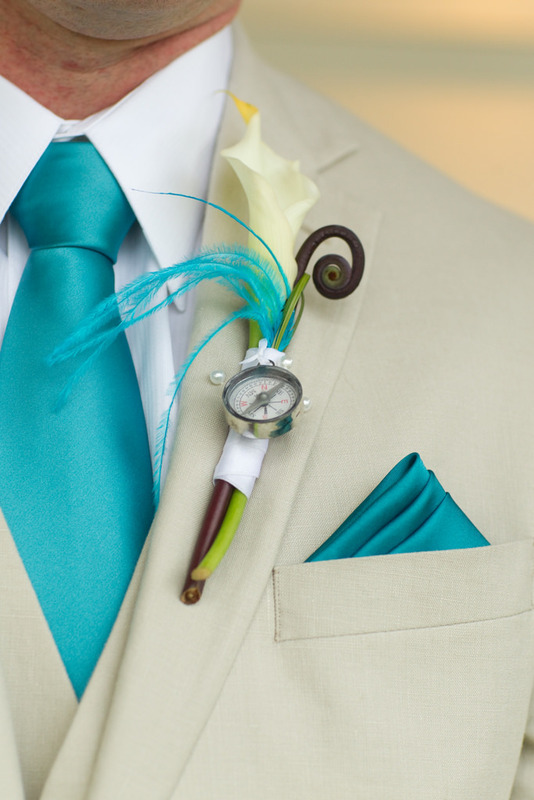 I settle for a very similar design but in a slightly less-attractive fluorescent green. Jody selects a rather fascinating bottle with a twist. Literally, a bottle with a twist. Like a twisted bottle – very cool! The model we contemplated was rather asymmetrical, something that she also found very alluring. 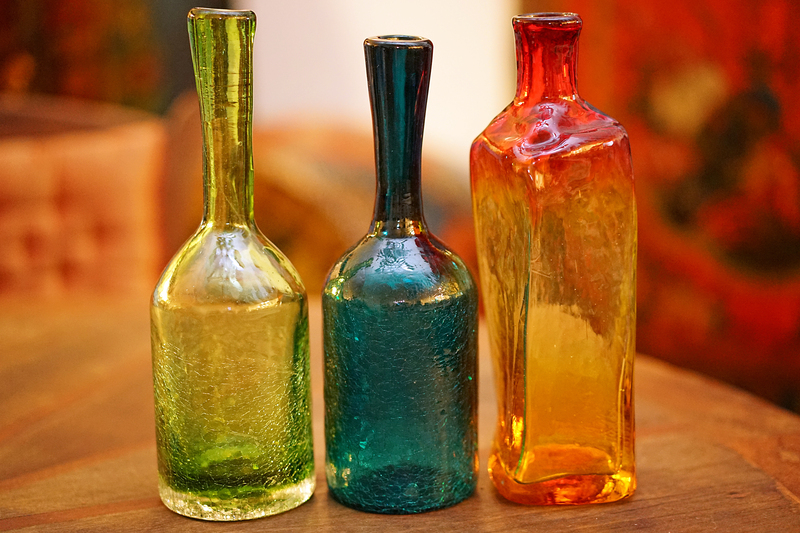 Her bottle’s color gently faded along the bottle’s length between a bright red and a diminished yellow. After negotiating price – and this place is open and even encourages haggling, a rarity for Japan – we were off to the factory floor. Be ready to spend a few dollars here if you select a larger piece of unusual design. 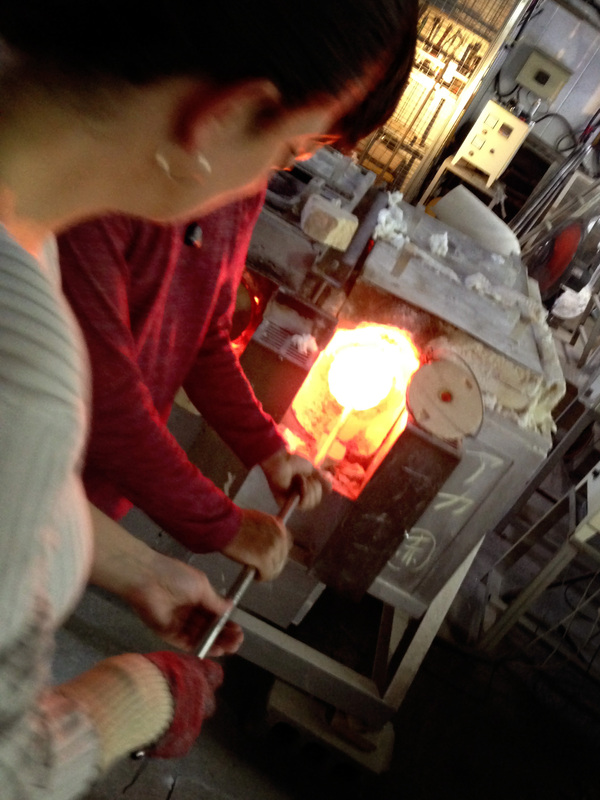 At the Onna Glass Studio, you “the creator” are much more involved in the birthing process, from conception to delivery. Yeah, sure, the three staff members surrounding you the entire time are helping (quite a bit actually) like midwives, but you certainly feel like you are doing the work. 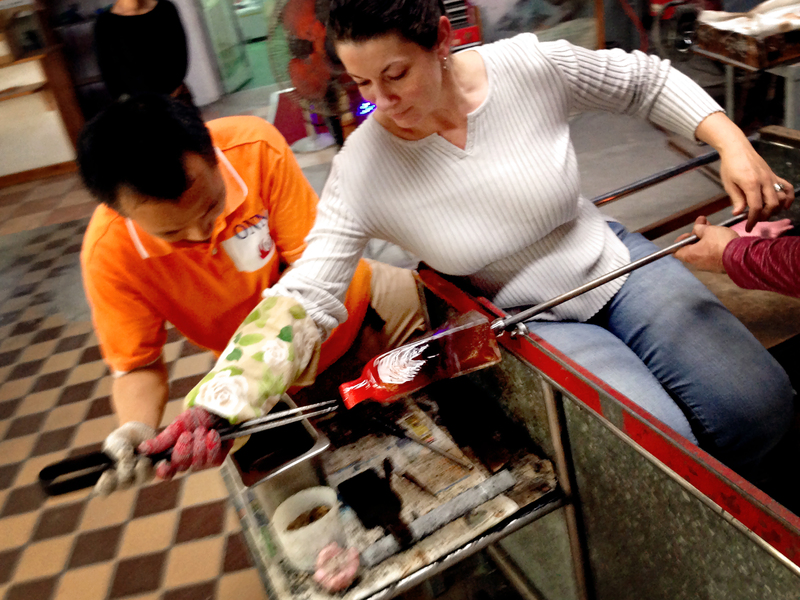 Did I mention how much you have to spin the blowing bar and molten glass – constantly – the ENTIRE time?? Both Jody and I were counseled, gently at first and then with more eagerness, a number of times to “keep spinning, fingers only,” which we found nearly impossible. 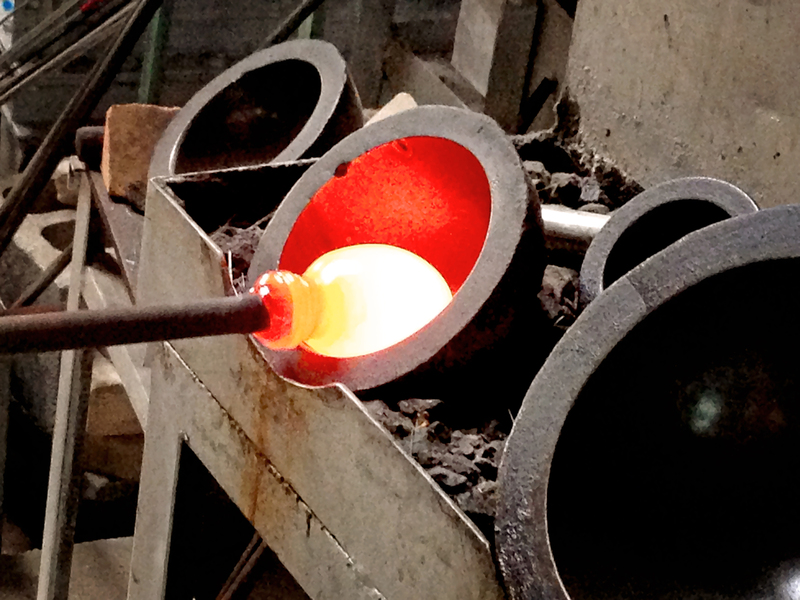 Molten glass is first wound on an iron pipe, a hollow bar that is used to collect, blow, shape and form your creation. 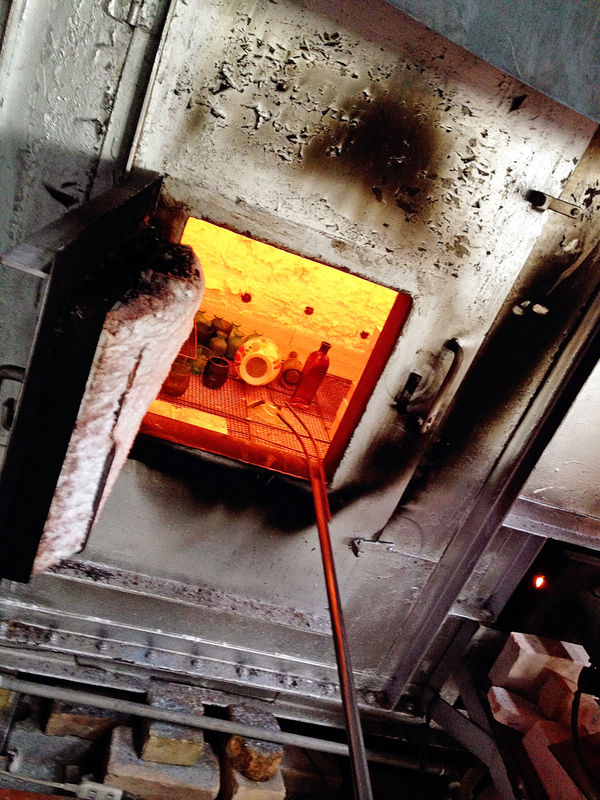 Constantly spinning the bar, its tip is carefully placed into kilns operating at over 1,300C/2375F to pick up molten glass. The heat in the vicinity of the furnaces is oppressive, and once its protective cover is opened, a wave of heat radiates and seems to strike you much like a physical shove. 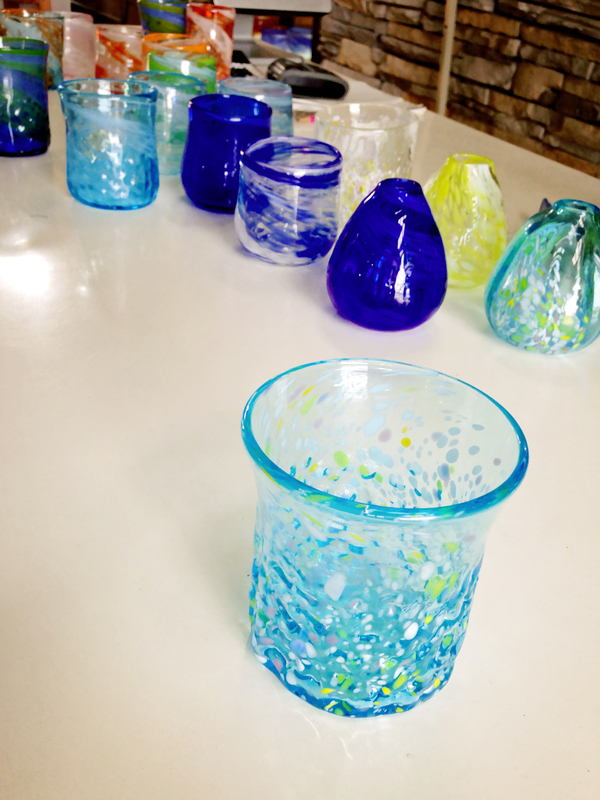 Multiple stops are required at various different kilns to get the right amount and the right types of glass, all of which is white-hot when wound. 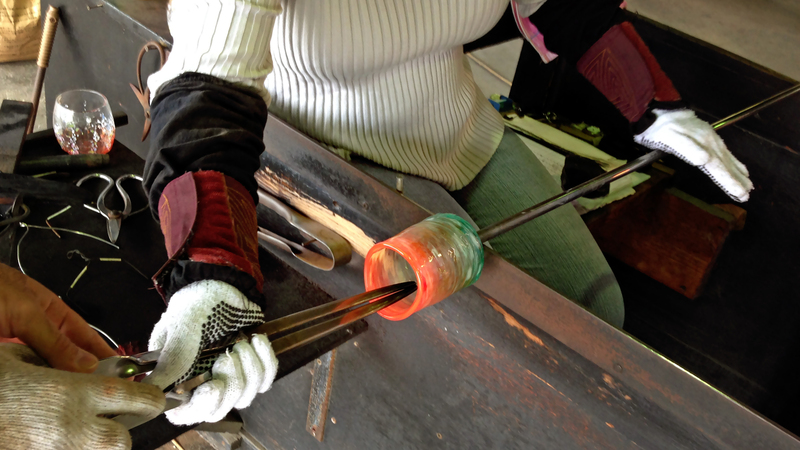 There is a small amount of blowing in-between to shape the glass and keep it spherical. Did I mention yet that during the entire time you have to constantly spin the bar?? The glass at this point is more liquid than solid, and it can’t be neglected for more than a short heartbeat or two. Next it’s off to blow the glass into a mold. A heavy-duty, thick-sided iron mold is placed on a sheet of steel on the floor, squarely behind a heat shield designed to protect lower bodies of craftsmen. 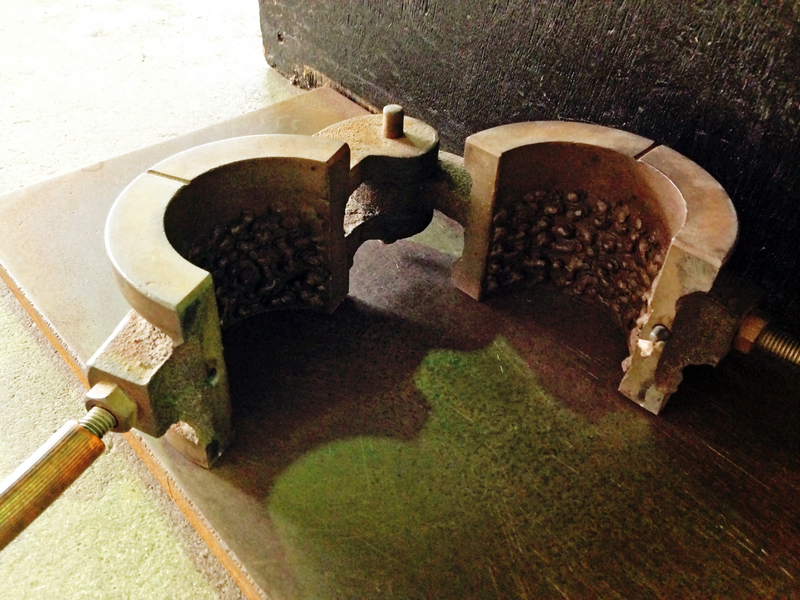 We are directed to finally stop spinning the pipe, and place it carefully vertically straight down into the open mold. 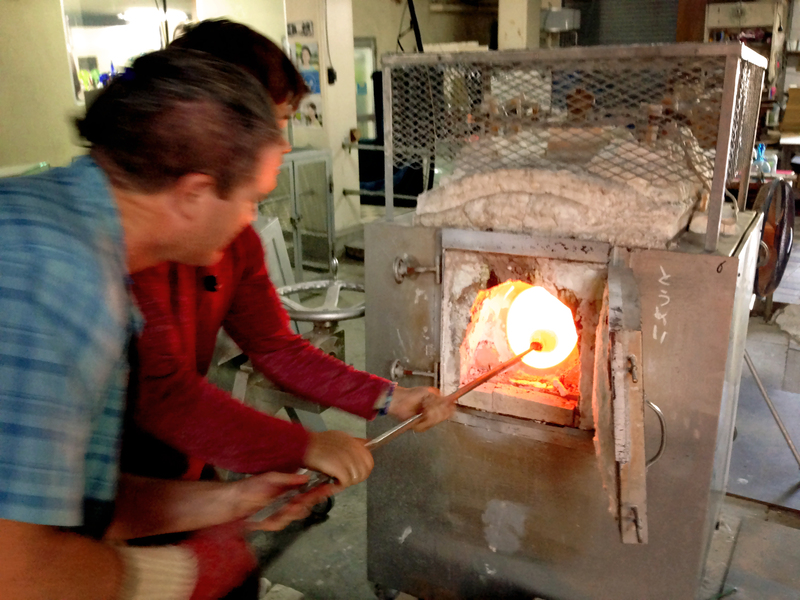 The mold is then closed, and you blow through the pipe until the molten glass entirely fills the confines of the cast. Things happen quickly now because the design must be completed before the glass starts to chemically fuse and cool back into a solid – a process which is already happening. 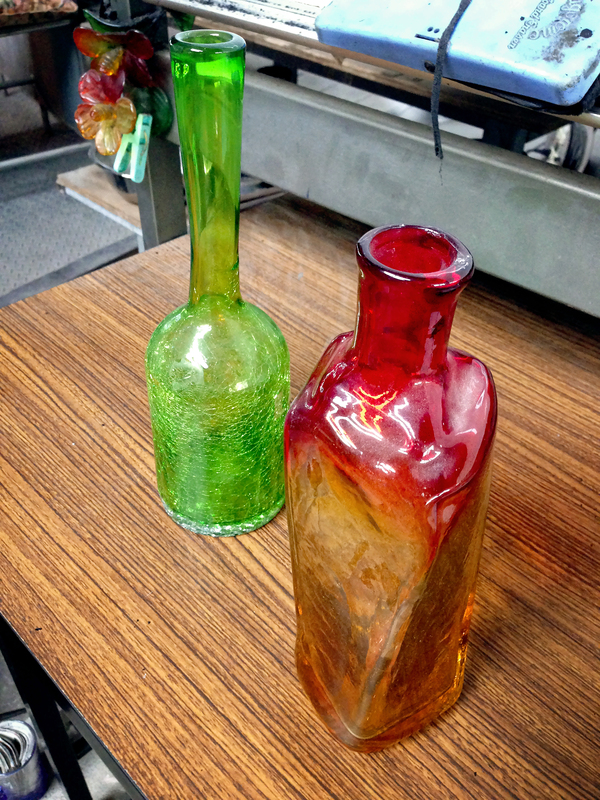 From what I understand, glass is an unforgiving medium, and re-firing cannot be used to fix many mistakes. My piece has a crackle design near its base. 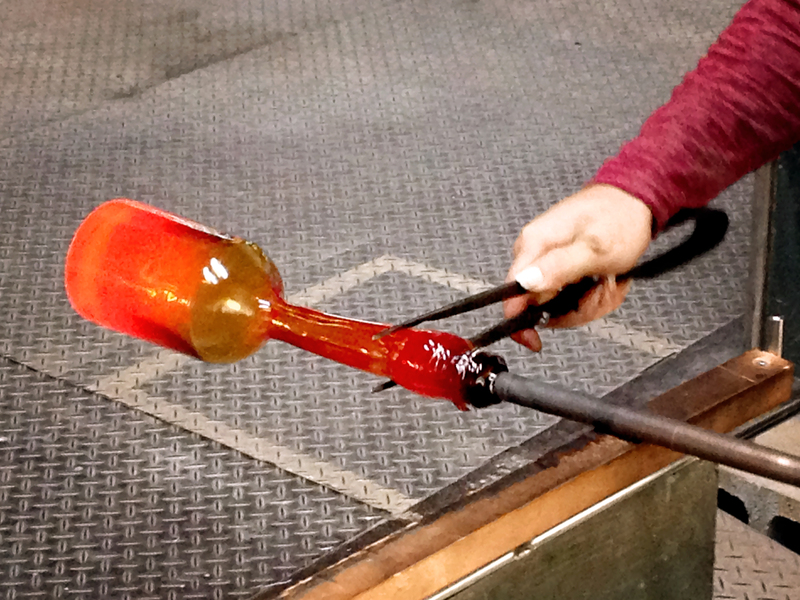 Taking the formed glass from the mold, still on the end of the blowing tube and glowing red-hot now instead of white, I dipped (with guidance) my piece into cold water just for an instant or two. The sharp temperature difference produces cracks only on the surface of the glass, which remain only as a subtle design element not interfering with the glass’ functionality. Now we sit in the finishing chair. 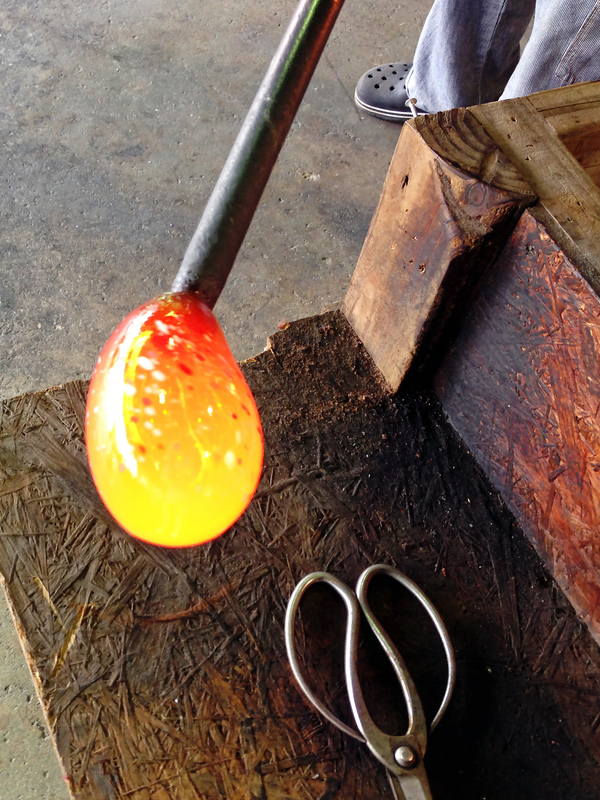 We were both involved in flaring our bottle’s lips, a technique that involves placing outward pressure with metal tongs on quickly cooling glass, now barely glowing, while the piece is rotated horizontally on guides. After the flare is finished, we score the specimen’s water cool water is applied, creating a natural fracture point in the crystalline structure. Lifting the bar slighting, we bring it down with some force and the bottle gentle is released from his metallic captor. 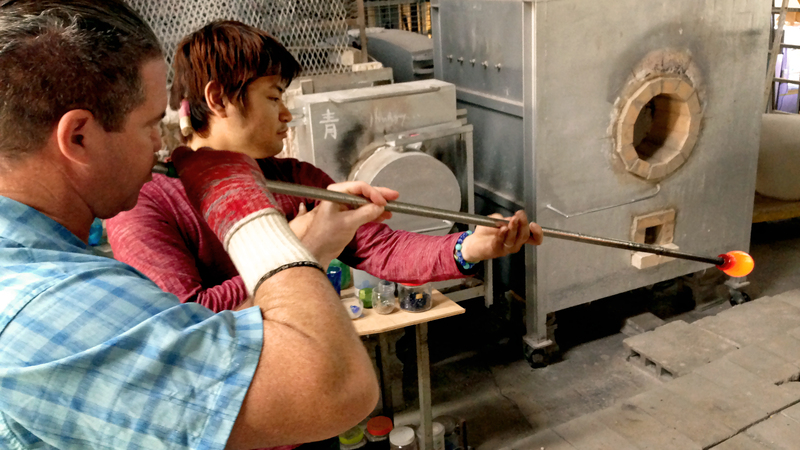 The area, on the bottom of the glass, is quickly re-fired and smoothed by the shop’s staff. Now that the pieces are done, they are placed into another larger not-so-hot-but-still-freakin’-hot kiln for controlled cooling. Jody’s bottle actually fell over, which initially I thought was a mistake, but something the craftsman who placed it that way wasn’t overly concerned about. In hindsight, this is probably how the additional asymmetry of that particular design is introduced because Jody and I both noted its equal proportions when molded. Returning the next day to pick up our masterpieces, we were amazed to see our completed works! Jody, however, noticed a sharp spike of glass on the very top of the rim of her bottle’s neck. When we asked if there was anything that could be done about it, a woman working the showroom took sandpaper and attempted to “erase” the issue. As you might guess, this did blunt the defect, but more so scratched the glass…. Realizing we were unhappy with that result, she tried to just give us the model we had initially selected from the floor to show the craftsman what we wanted to create. “No, no, no we don’t want that, we want the one we made!” Jody, being coyly smart and fast on her brainstem, went and got the blue bottle that I had wanted to make, which the ladies working there were only too happy to part with. They couldn’t make it anyway. So, we walked away with our two hand-made pieces, AND with the fabulous sapphire decanter. SCORE! Reservation is not required at either location. Neither was very crowded. 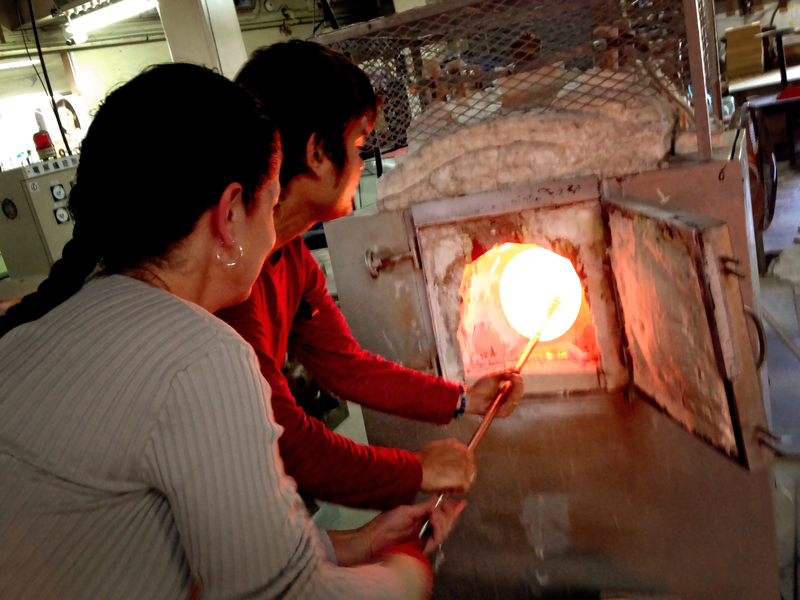 We waited behind a group of three at the first location, and had no wait at all at the Glass Studio. Once your piece is selected and the factory floor is ready for you, the process takes roughly 15-20 minutes, but you are required to leave your masterpiece overnight for proper cooling, so make sure you allow for pick-up the next day. And be forewarned that these pieces are NOT commercially produced and therefore should not be exposed to heat or hot foods or drinks, and cannot be used in the oven, microwave, or dishwasher. Go and experience this corner of our Far East Fling. Rebirthing these glass creatures anew provides a spiritual connection to Okinawa, her history and her people which will last through time. 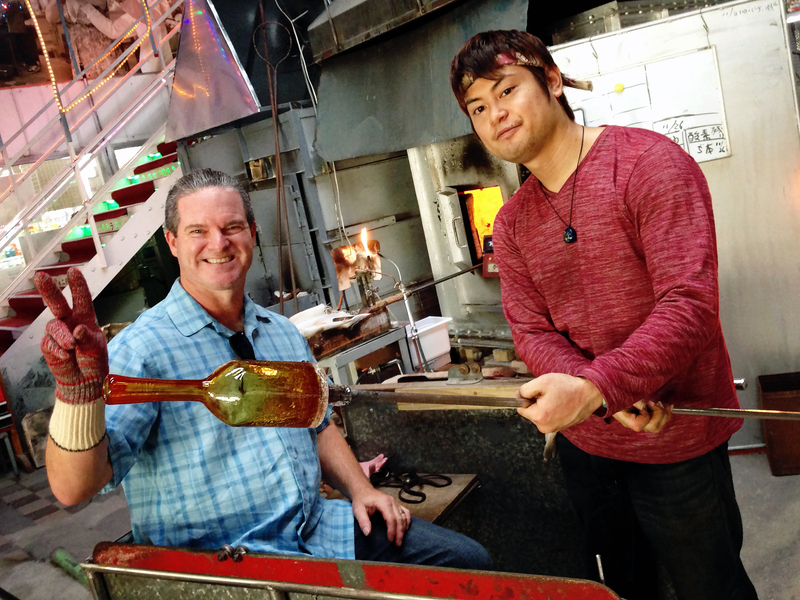 But their emotional essence – the soul of Ryūkyūan Glass, just might help you overcome an adversity or two of your own in the future.